When product specifications require a specific color, simply spec­ifying the passband and stopband is not the best way to ensure repeatability of the desired color. 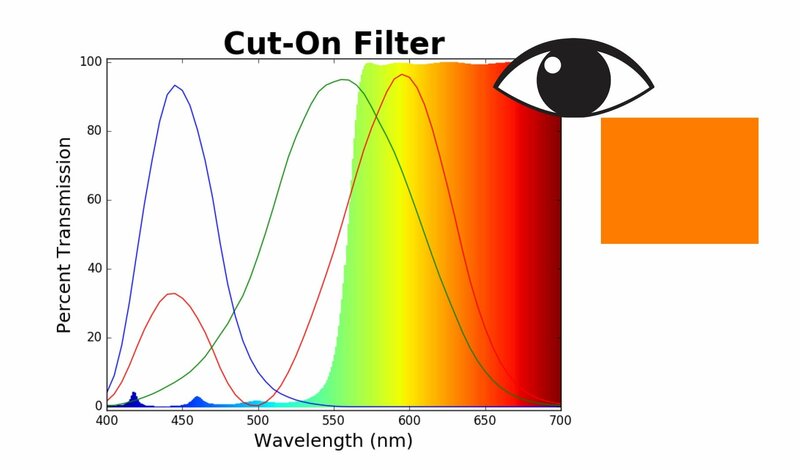 Cut-on filters can control the light coming from the light source, but to control how the hu­man eye will perceive the filtered light source, it is important to take into account the color matching functions of the human eye. Color depends on the light source used and how sensitive the human eye is to different parts of the visible spectrum. For this reason, a color target in color space and tolerance should be specified to achieve repeatable performance of colors.